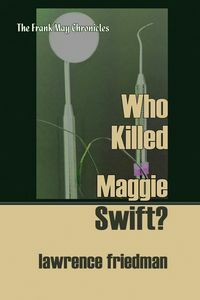 Who Killed Maggie Swift? by Lawrence Friedman: Synopsis and Online Purchase Options. Synopsis (from the publisher): Frank May practices law the safe, routine way: wills, trusts, business law, books, forms, and documents. At least that's the way he wants it … but clients and life don't always oblige. Frank avoids murder cases like most people avoid the dentist. That's not so easy to do when a dead body shows up during his routine appointment for a teeth cleaning, and he is thrust into an investigation that bridges his law practice. He needs to get to the root of this death. That will take more than scraping the surface of a dental practice with deep secrets and suspicious characters — or the nearby bizarre Xyloquex Corporation. If Frank May is up to the task, he seems to be the last one to know it.